Hearing Week For Costco/A.W. Stanley Park…..GOP Smears Take A Hit With Arrest On Phony Website….Council Restores Dial A Ride, $$$ For Cops…. 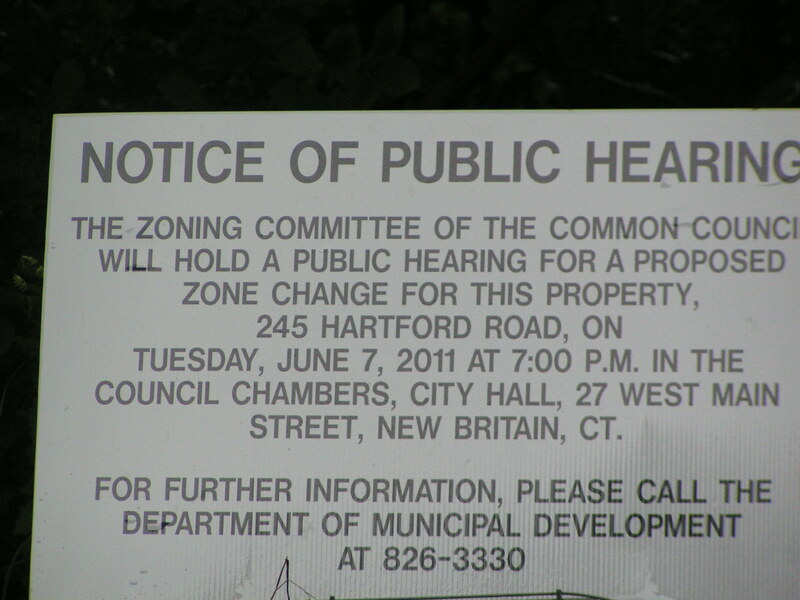 Notice of public hearing posted on Hartford Road. Behind the sign is the 9th hole of the White Nine of Stanley Golf Course and the proposed site of a COSTCO store. A public hearing and meeting of the Common Council on June 7th and June 8th are expected to stir strong debate on the proposed siting of a COSTCO store on the white nine of the 27-hole Stanley Golf Course. The plan calls for relocating two golf holes across the street on a pristine parcel of A.W. Stanley Park. The COSTCO store would be built adjacent to the Target Store — a development approved by the Common Council in 1999 which involved the abandonment of single family homes on Glen Carlyn Road and an earlier alteration of the golf course. The Target project did not involve the taking of any of the wooded park across the street. This slim corridor of New Britain real estate at issue has a particularly high value for retailers. It is down the street from the 138-store Westfarms Mall and the Corbins Corner shopping center that intersect on Farmington and West Hartford land — towns that gain all the tax revenue from those sprawling shopping areas. Proponents are pushing the conversion for economically-distressed New Britain to gain tax revenue and jobs at the expense of open space and a radical change to the golf course. The Friends of Stanley Park, a group of residents and preservationists, are opposing development that would take out a portion of the wooded park and wetlands area amounting to destruction of space long held in a land trust. “A. W. Stanley Park’s wooded areas provide valuable habitat for wildlife, with over 150 species of birds and diverse plant life,” says the Friends’ group on their Facebook page. “The woods are used by local residents for recreational walking and running, observing and photographing wildlife, and simply enjoying time in natural surroundings. The woods provide sound barriers to traffic noise from Route 71, help to filter and purify the water supply to the pond they surround, remove greenhouse gases from the air, supply oxygen, and cool the surrounding neighborhoods.” Opponents urge that the city use development parcels in other parts of the city to grow the grand list and develop job opportunities. The Zoning hearing of the Common Council will be held Tuesday, June 7, at 7 p.m. in the second floor Council Chambers at New Britain City Hall, 27 West Main Street. The reported arrest of Republican Cris Carillo late last month on charges that he cyber-impersonated former Alderman Phil Sherwood on a web site falsely bearing Sherwood’s name reflects a recurring pattern of gutter politics by New Britain Republicans during the Stewart Administration. The charge is not a failed attempt at “parody” that “wasn’t executed well” as GOP Chair Dwight Blint said, but a case of unlawful identity theft far outside the boundaries of “hardball” politics. No GOP party official has bothered to just say it was wrong, nor has an apology been offered to Mr. Sherwood. The phony website and the allegations fit into a string of political dirty tricks meant to deflect attention from issues and policy questions. Scurrilous messages — in blogs, on websites and through the mail — have attempted to denigrate New Britain Democratic elected and party officials and citizens in personal and insulting ways over the last several years. The crescendo of outlandish and mean-spirited rhetoric probably reached a peak during the 2009 municipal election campaign; the verbal brickbats were directed anonymously at anyone who differed with Mayor Stewart on policy, budgets and transparency in city government. The rhetoric gave the city a black eye, hurting the legitimate views of fiscal conservatives and fair-minded Republicans. The juvenile and outrageous nature of the attacks haven’t swayed voters. The anonymous cheap shots have been accompanied by very public trash talking and negative remarks by Stewart and GOP Minority Leader Lou Salvio whose tirades and insults continue as the m.o. of the minority party. These gentlemen have never figured out when the political cheap talk should end and the business of running the city should begin. There are encouraging signs that the scurrilous, anonymous attack strategy has finally run its course. Over at the Republican Town Committee website, a prominent link to the “Busy Bee” blog — a primary purveyor of hateful and distasteful posts maligning Democrats — is still there but the content and site has suddenly been removed. Sorry, the blog at thebizybee.blogspot.com has been removed. This address is not available for new blogs. Too late for Mr. Carillo. His current troubles are a stronger lesson that he should not have allowed himself to be used as a pawn in the attack strategy of the New Britain GOP. The Common Council sent a revised municipal budget to Mayor Stewart on May 27th that held the line on taxes but restored some services for the fiscal year that begins July 1st. Council Democrats, ignoring verbal sniping primarily from Minority Leader Louis Salvio, worked throughout last week of May to restore some services that a lame-duck Stewart identified for the chopping block to keep the mill rate level. The Council strongly urged the Mayor to seek concessions from unions representing city workers to reduce a threat of layoffs to essential services such as public safety. Stewart had estimated the layoffs of up to 67 municipal employees would be necessary to come in under his budget. With time short before the July 1 fiscal year Stewart accepted the revised budget and said he would enter talks with union locals to discuss cutting personnel costs to balance the budget. This entry was posted in Meeting/Event, Municipal Budget, Weekend Update. Bookmark the permalink.